Do you know any magic words? 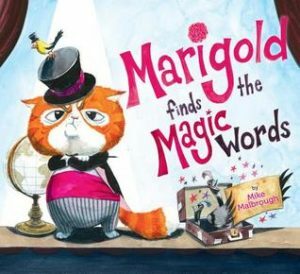 All kids already know them, so it is fun to explore some other magic words that Marigold comes up with to get what he wants at his birthday party. He likes things his way, so when things go wrong, he gets miffed. His anger gets the better of him. He says all kinds of words to get his way when finally he uses the right magic word. But, then he realizes he didn’t really want what he asked for. This dilemma helps him use the right magic words again. The art in this book really catches your eye and the story is a lot of fun for the kids and even teaches some new vocabulary. Very silly!